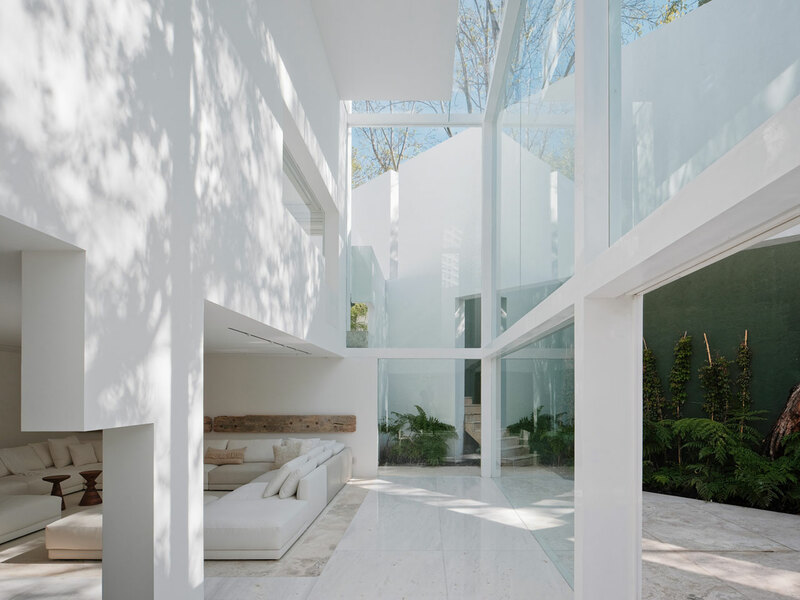 The bedrooms are located on the first floor with the master bedroom jutting out over the triangular courtyard, while the other two bedrooms open up onto a terrace overlooking a triangular pond sitting on top of the garage. 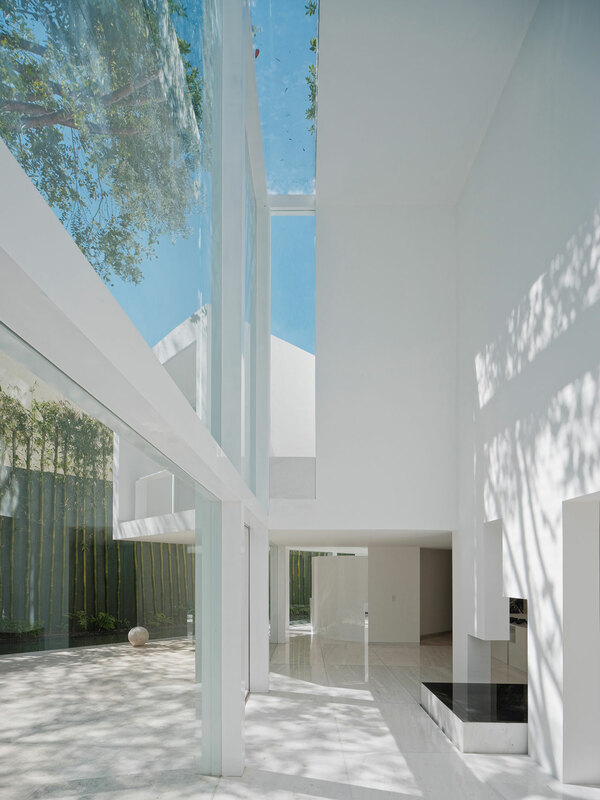 On the top floor, a rooftop pool is sheltered on all sides for privacy and shading while a series of slim cut-outs allows glimpses of surrounding vegetation and the discrete interplay of sunlight and shadows throughout the day. 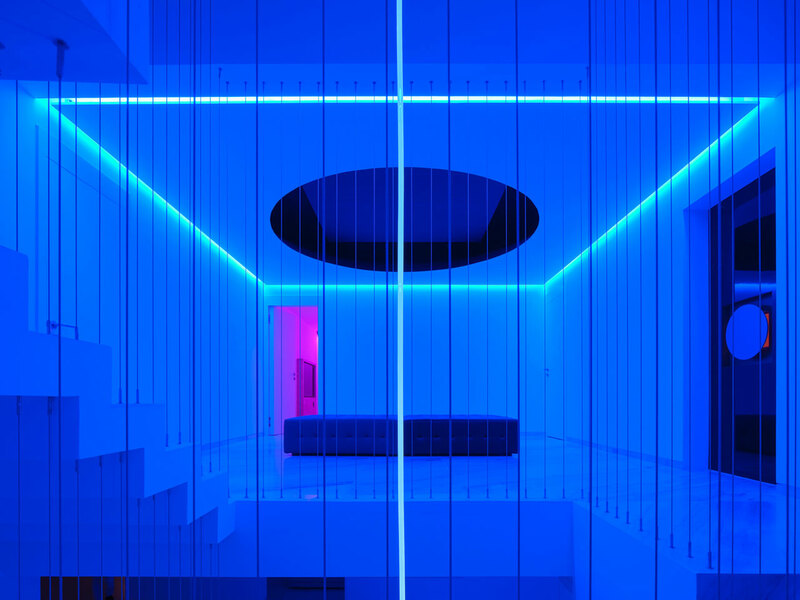 At night, the all-white interiors are transformed into a three-dimensional canvas of neon colours that harmoniously blend into each other. 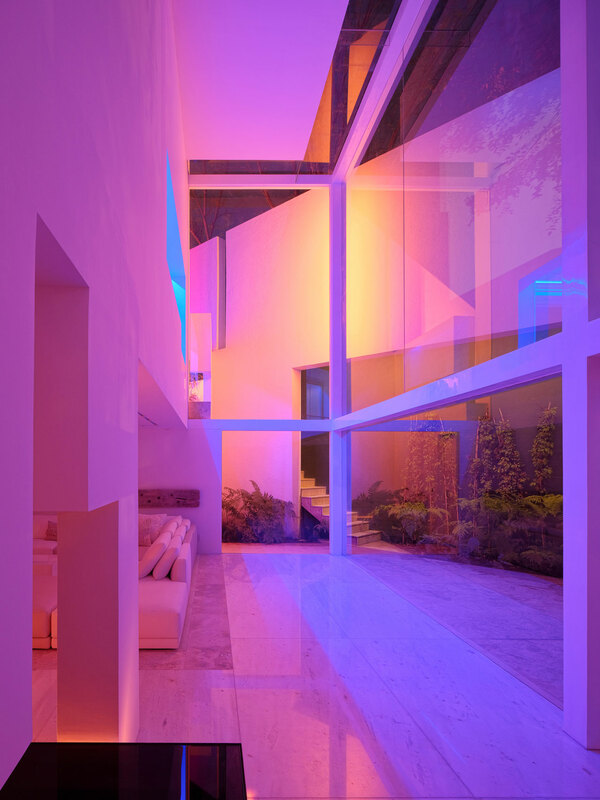 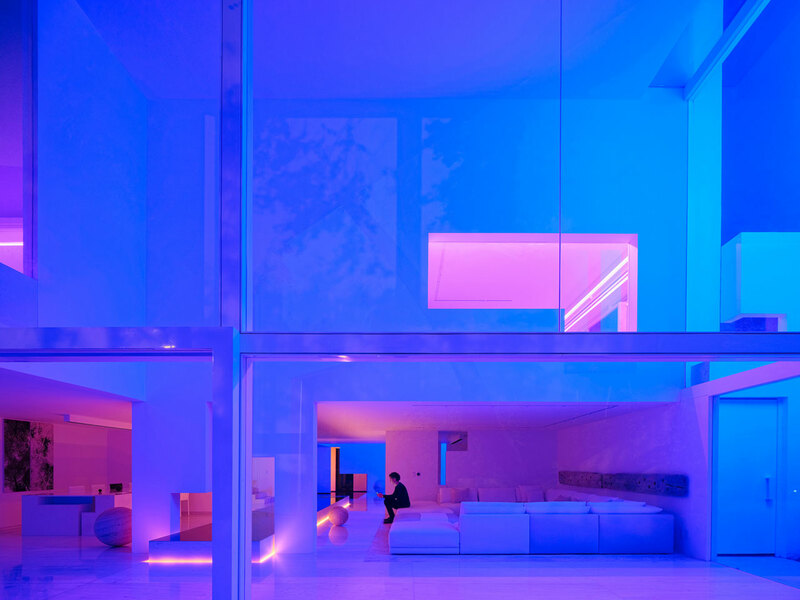 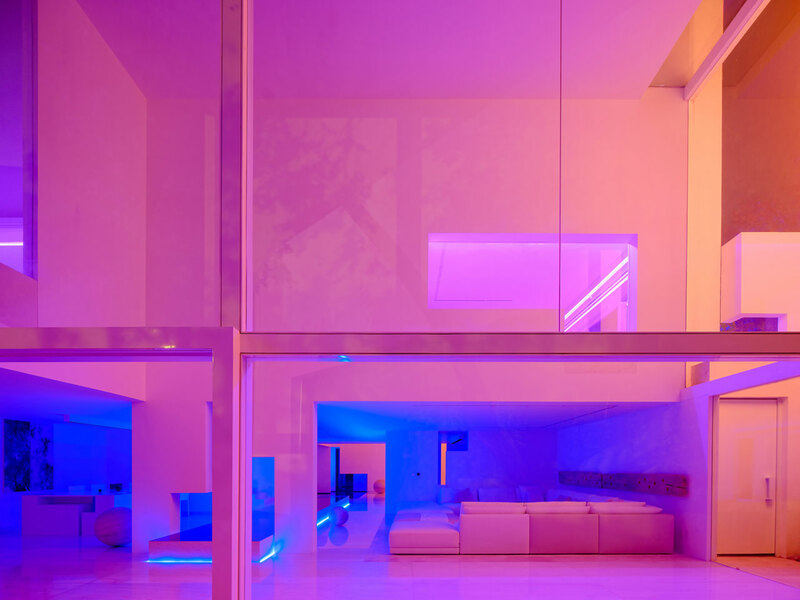 Bright blue, orange, purple, pink and red hues illuminate the rooms that cast a prismatic glow out of the windows. 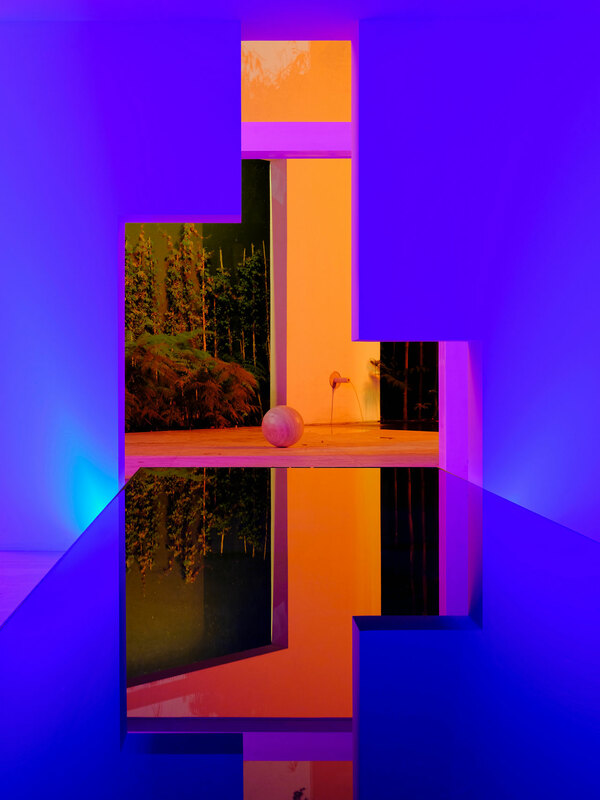 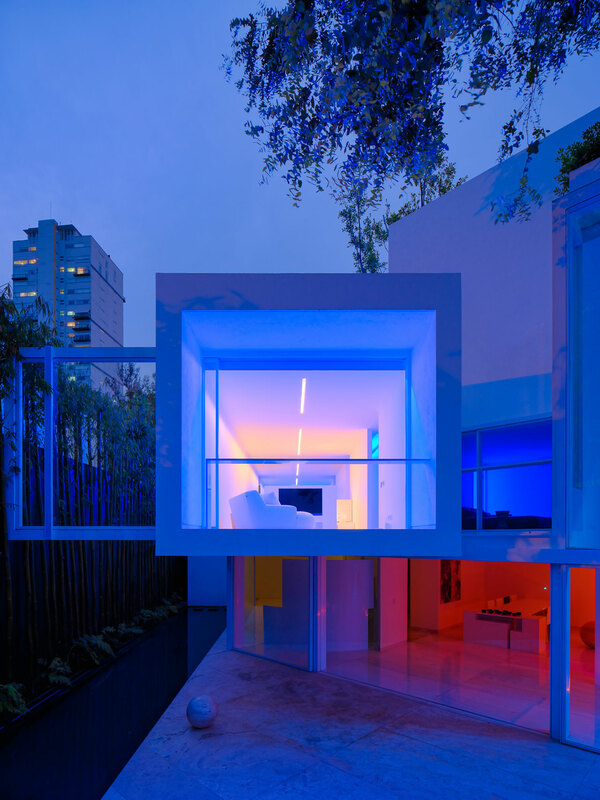 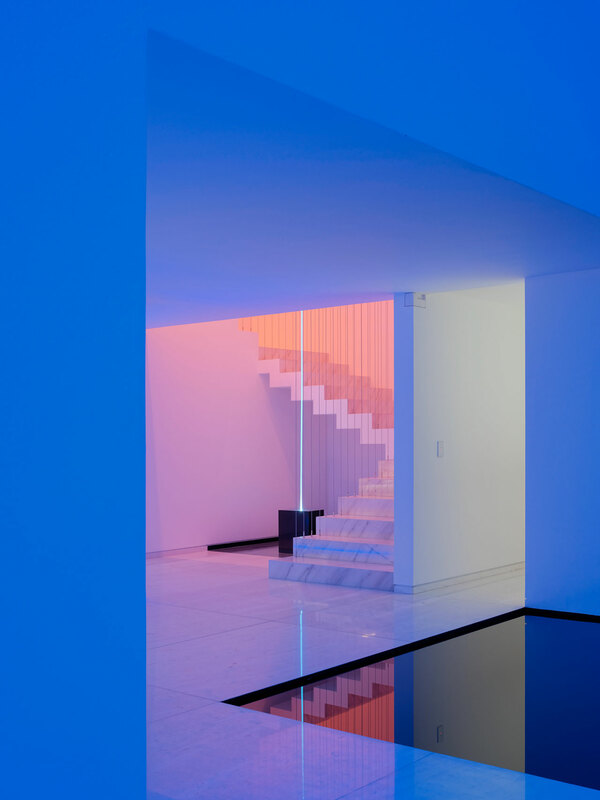 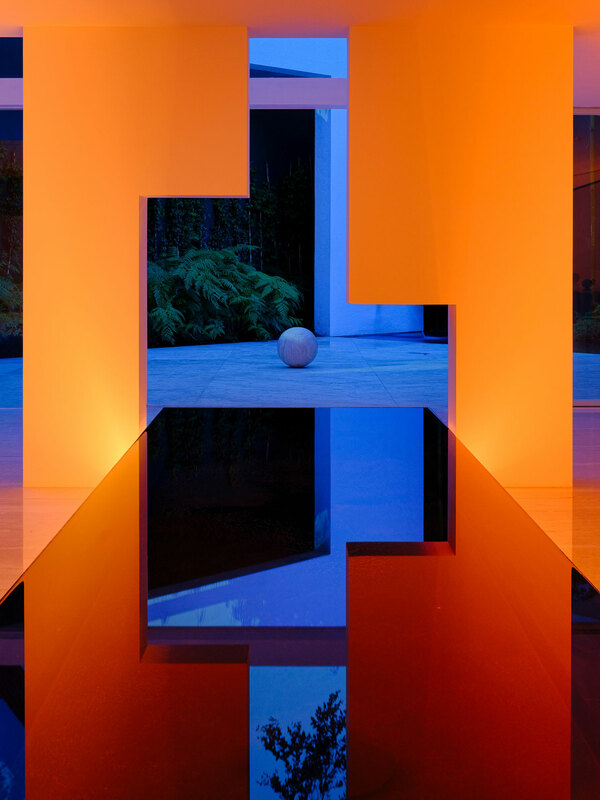 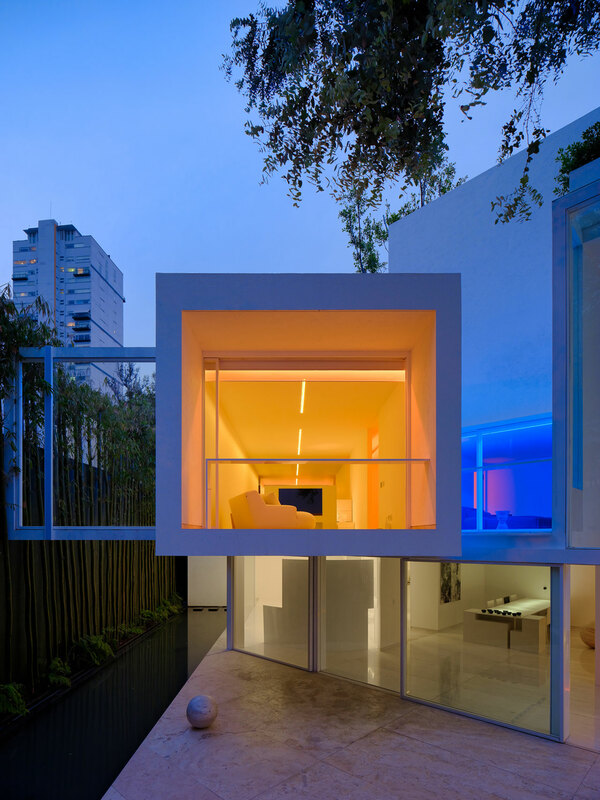 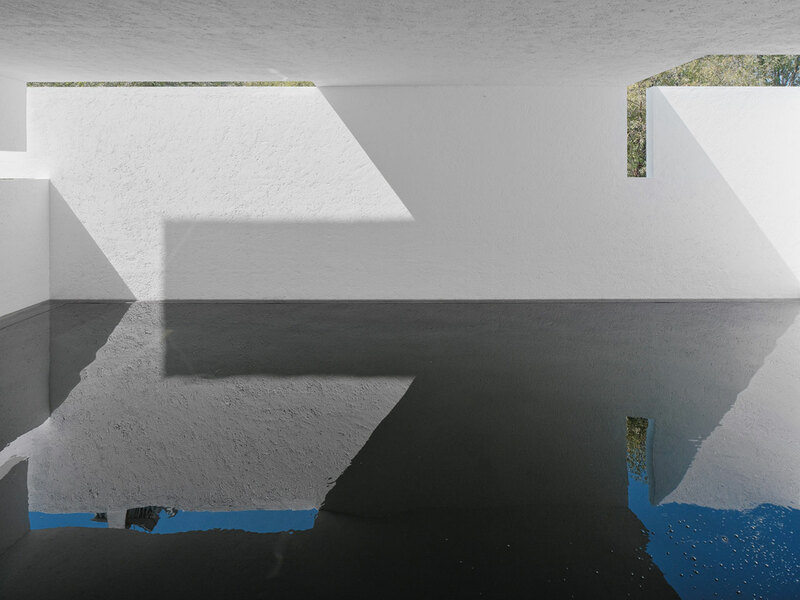 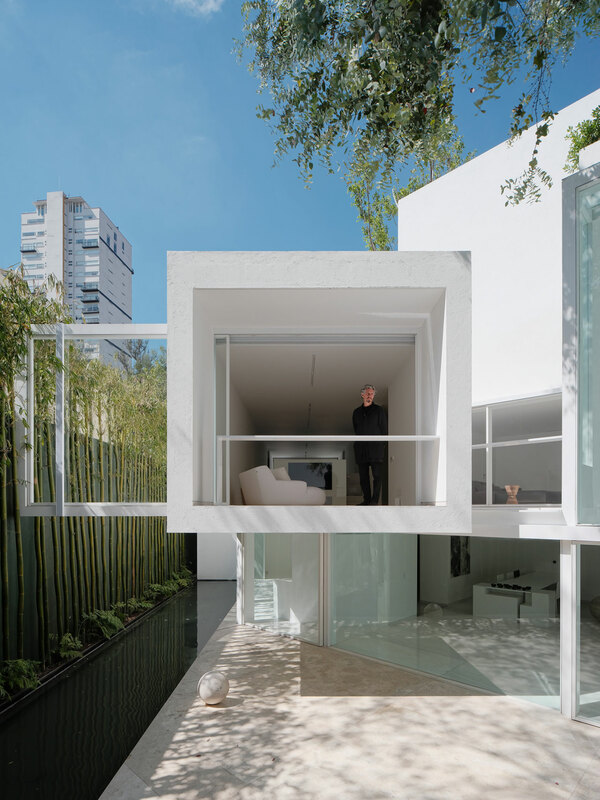 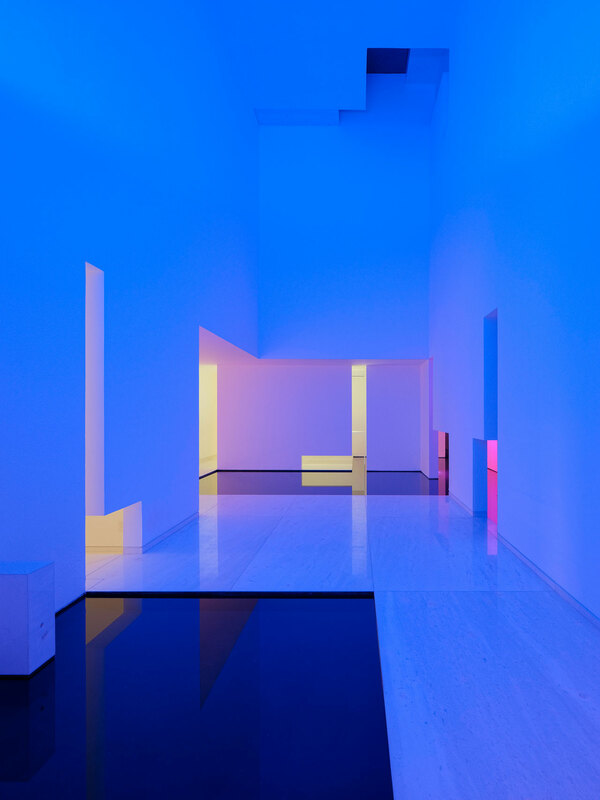 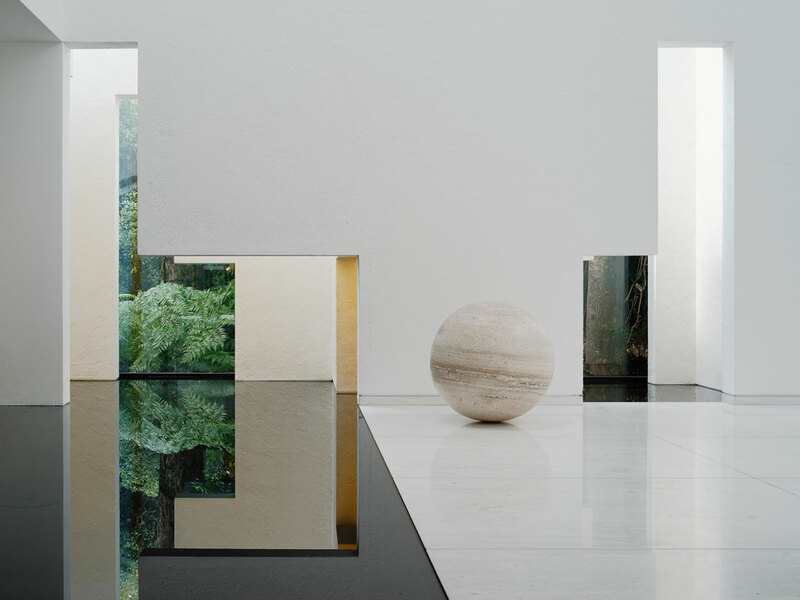 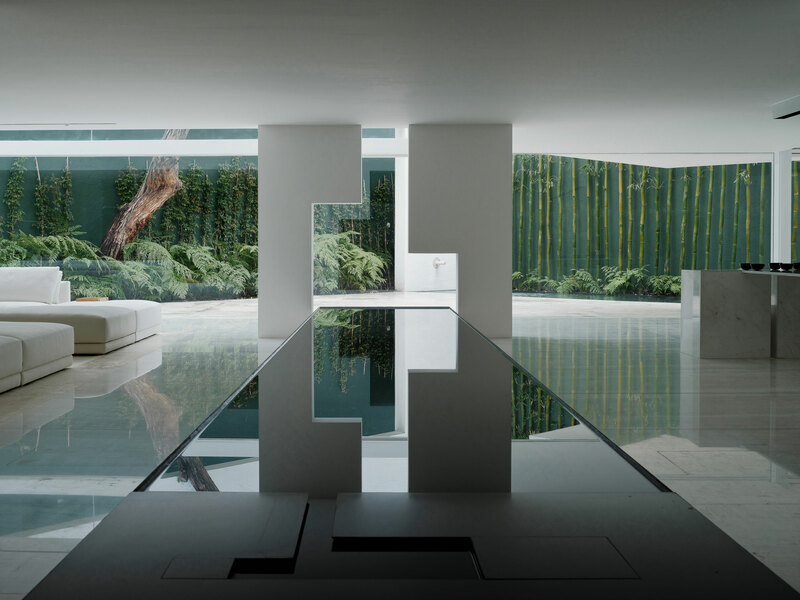 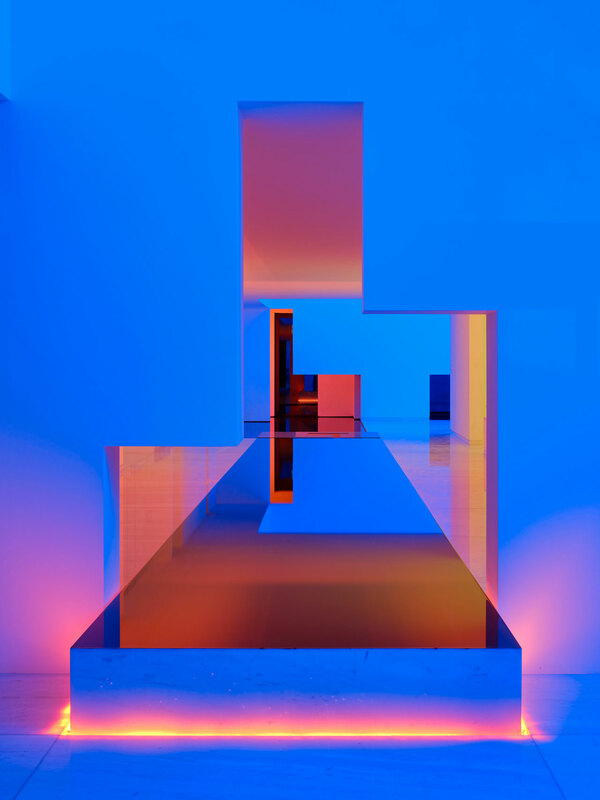 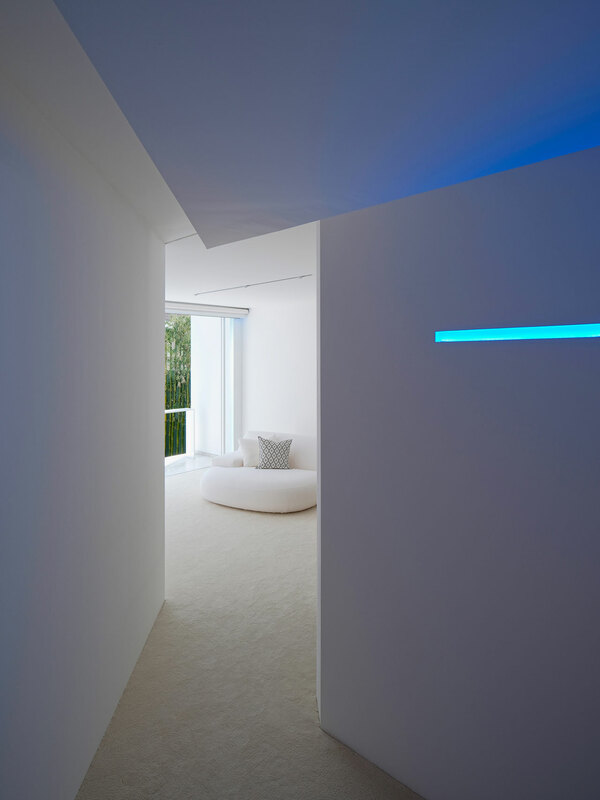 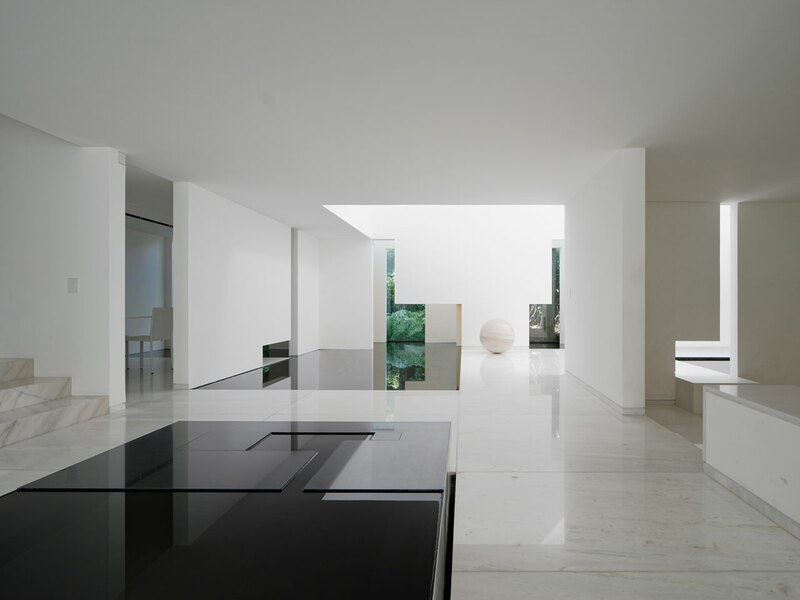 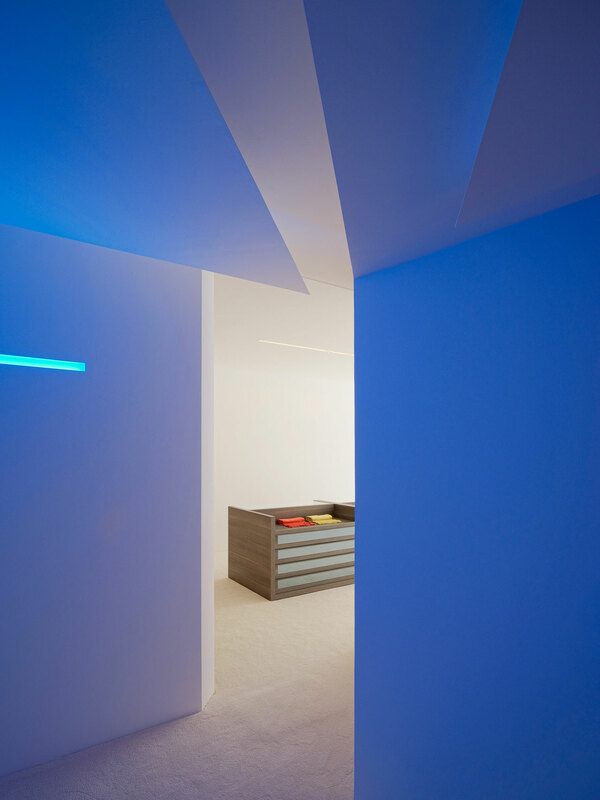 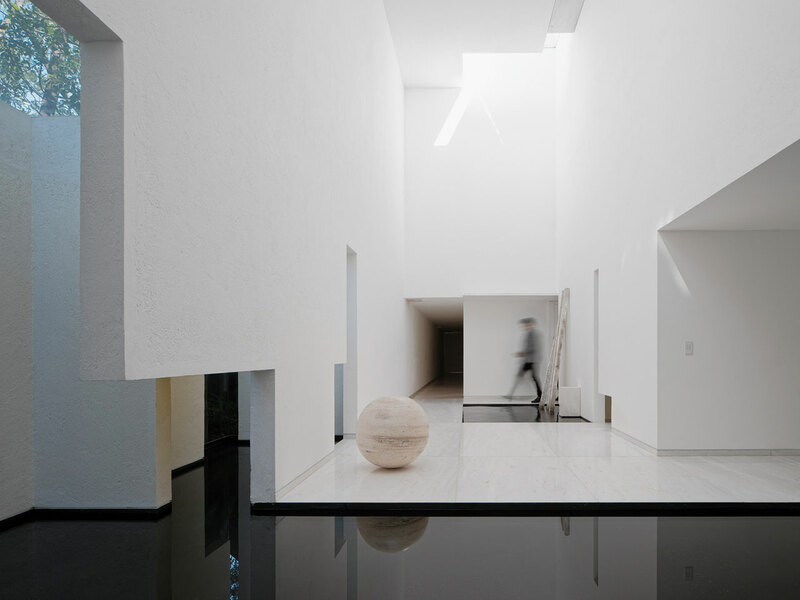 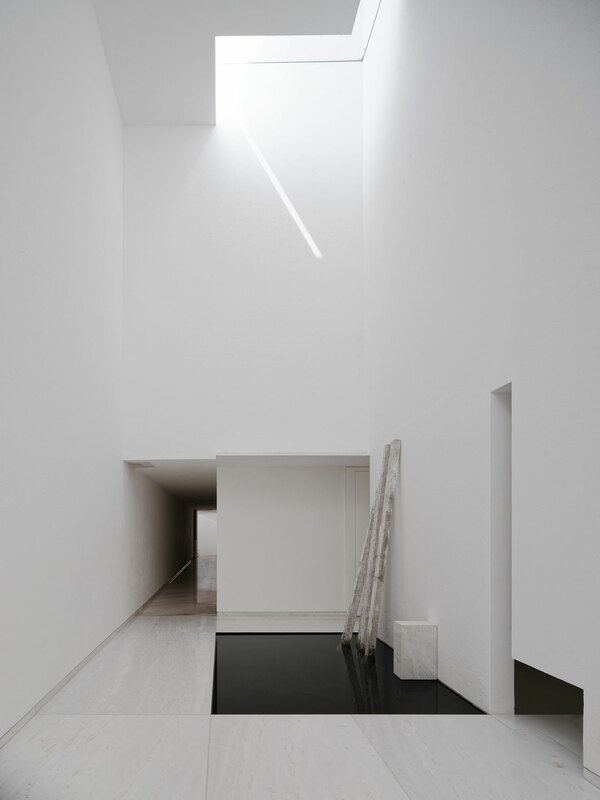 The shifting colour combinations that wash over the architecture bring to mind artists such as James Turrell and Dan Flavin whose seminal exploration of space and light never ceases to amaze. 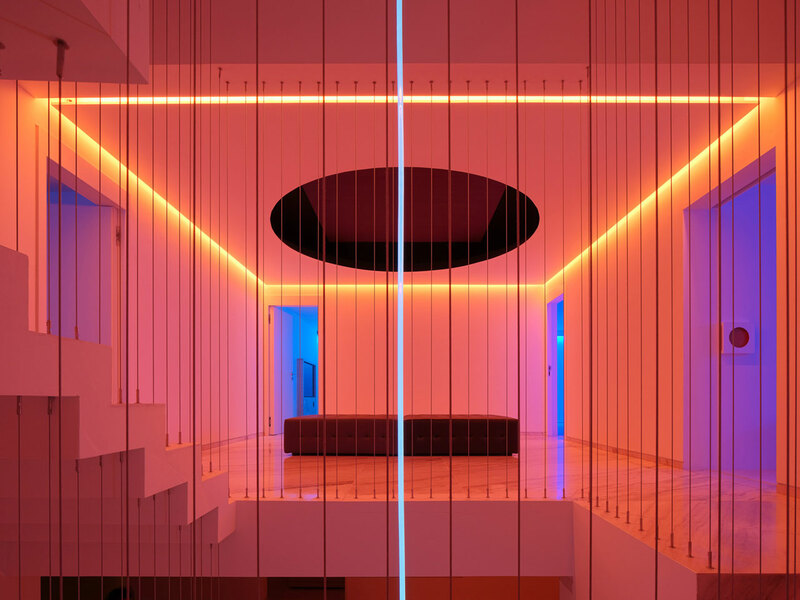 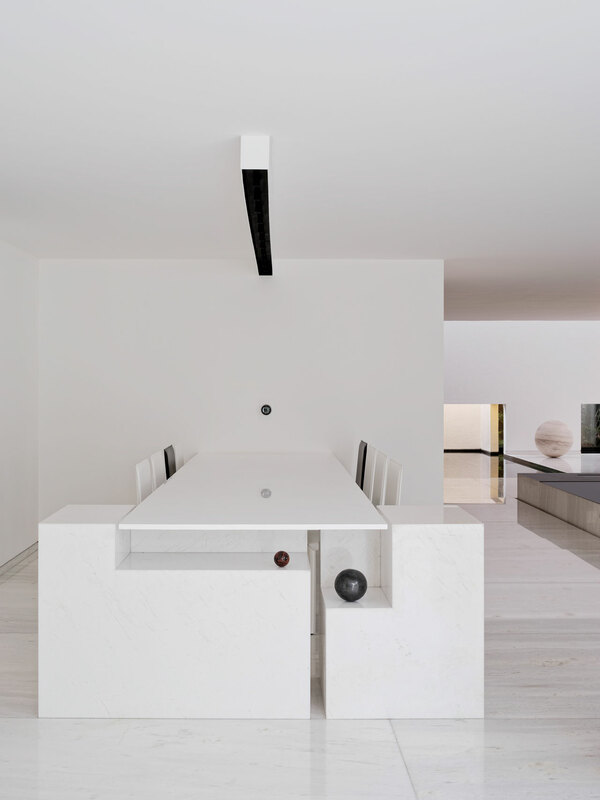 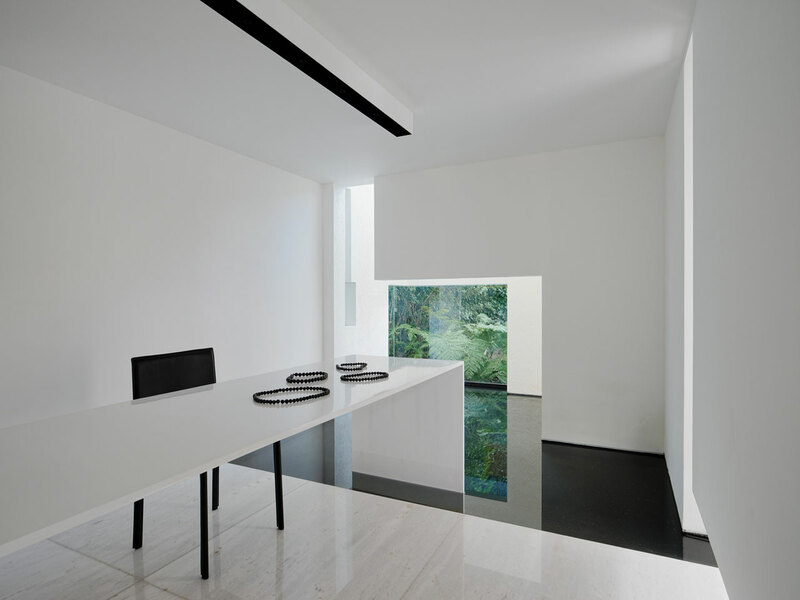 Like those artists’ work, the introduction of coloured lights invites the occupants to experience the spaces anew, to recalibrate the physical presence of their surroundings. 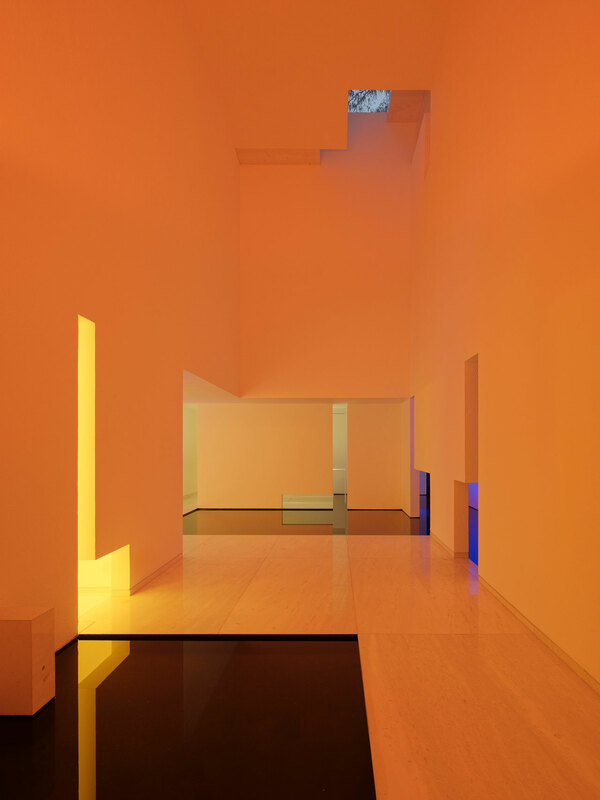 The colour scenarios also allow the ambience of the rooms to tune in to the occupants’ mood: soothing or energizing, cool or warm, discrete or flamboyant. 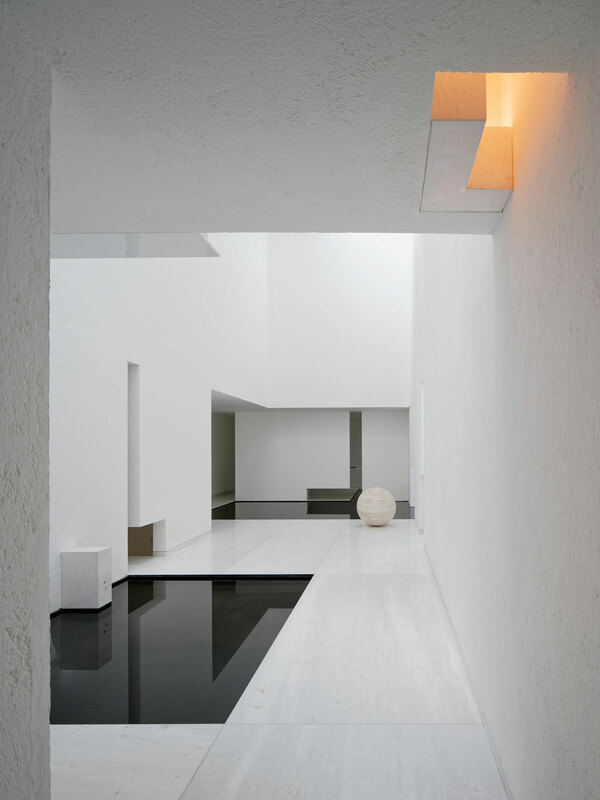 Minimalist design hasn’t looked so viscerally satisfying in ages.